To ensure that your trees are safe and protected from potential damage, it is important to use professional tree care services and maintain them throughout each season. In addition to controlling their growth, this will also help them look their best. When the temperatures get warmer, the first step towards maintaining the trees and plants on your property is to clear off the remaining debris and clutter of the wintertime. Gather the scattered twigs, leaves, sticks and fruits that collect beneath trees over the cold months. Trimming and pruning are imperative to a productive tree care routine. They can help the trees overcome winter damage caused due to snow storms and ice accumulation. Make sure you have the right pruning tools and that they are in excellent condition. Look for old, dying foliage and branches that you can cut back. An experienced arborist may suggest cabling and bracing the trees to reduce the potential damage due to high winds and help sustain them in the hot summer months. After pruning the trees, you must mulch the landscape properly. This helps secure the organic matter that trees require beneath the soil surface. It also helps to control weeds, add nutrients to the soil, and conserve moisture. Before your shrubs and trees enter the peak growing season in spring, apply a slow-release fertilizer. This will replace the nutrients in the soil and help enhance the trees’ resistance to damage caused due to insects, diseases, and harsh weather conditions. Remember, without proper fertilization, they won’t reach their full potential and will have shorter lifespans compared to well-fertilized trees. While you can do all the planning ahead, you must remember that hiring experts from an experienced company is always worth it and is crucial for your trees’ long-term maintenance. At DreamWorks Tree Services, we provide professional assistance to maintain your trees during the spring. 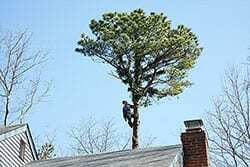 We offer tree care services in many Greater Toronto Areas such as Newmarket, Pickering, Georgina, Whitby, Stouffville, Richmond Hill, and Aurora. Trimming and pruning are imperative to a productive tree care routine. They can help the trees overcome winter damage caused due to snow storms and ice accumulation.